The new focus by prosecutors and securities regulators on the use of “expert networks” has been a jolt to institutional investors and attorneys advising clients in this area. High-profile charges and enforcement actions have suddenly resulted from conduct that, in some cases, was arguably not established as unlawful in the past. What is the latest from the DOJ and the SEC in this area? 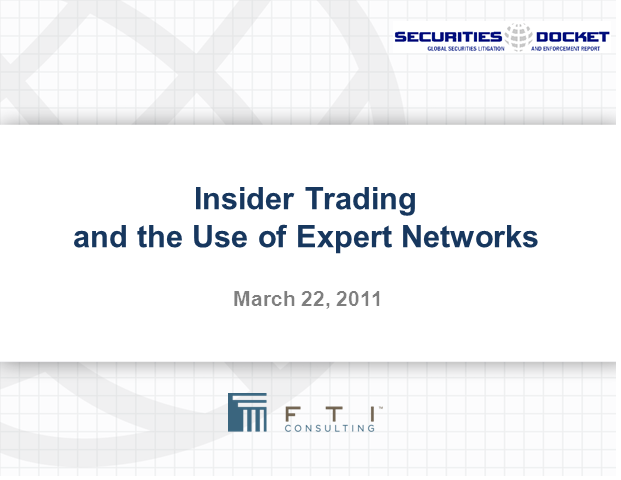 What are the new guidelines for institutional investors’ use of expert networks? How do these developments affect compliance programs? What information is “material” and how does this square with the mosaic theory? Our panel will consider all of these issues and take on your questions in a free one hour webcast. Please join Robert W. Pommer III, a partner at Kirkland & Ellis LLP and former Assistant Chief Litigation Counsel in the SEC's Division of Enforcement, and Stephen Prowse, Ph.D, Senior Managing Director at FTI Consulting for this webcast.